Known as LA FESTA, in capital letters, it has been declared Heritage of Humanity by Unesco. This is the performance of a sacred lyrical drama the theme of which is the Dormition, Coronation and Assumption of the Holy Virgin into Heaven, performed by singers from Elche on 14th an 15th August. From 11th to 13th August the general rehearsals take place. In spite of the fact that performances were forbidden inside the temples El Misteri survived thanks to a bull [Pope's edict] that was conceded in the 17th century. Throughout the days that the fiesta lasts also to be highlighted is La Nit de l'Albà, during which the townsfolk offer fireworks to the Holy Virgin and to La Roà from their flat rooftops, covering the area of the old mediaeval walls, holding a wake for the Dormition of the Our Lady. Each year that ends in an even number there are also extraordinary performances on 29th and 30th October and on 1st November. 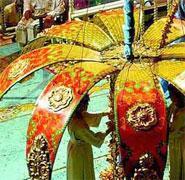 It is a masterpiece of Oral and Intangible Heritage of Humanity.